Yeah, yeah, yeah, the so-called “Historic Snowstorm” left two inches of soft powder in Delran (5 miles north of Riverton). But it may have been enough to turn the late-January issue of the Gaslight News into a Post-Groundhog Day Issue, so I posted the PDF today. I will stuff envelopes and mail the newsletters as soon as I get them from Joie Budget Printing in Cinnaminson. I do recall some historic snow storms. Well, maybe not in the meteorological sense. Upon returning to school the next day, students were all a-buzz with stories of snowball fights and sledding at Double Bunkers. Historic or not, Riverton kids (and a teacher or two) enjoyed the day off. Often, though, a Spring Break would be adjusted or the school calendar extended farther into June to make up the day. Each generation seems to define its own version of The Good Old Days and it amazing how the sight of an old photo or the scent of wet socks drying by the heater grate can reboot those memories. What will the kids of 2015 regard as their Good Old Days? Snow and ice have certainly caused their share of fun as well as commotion here over the years. 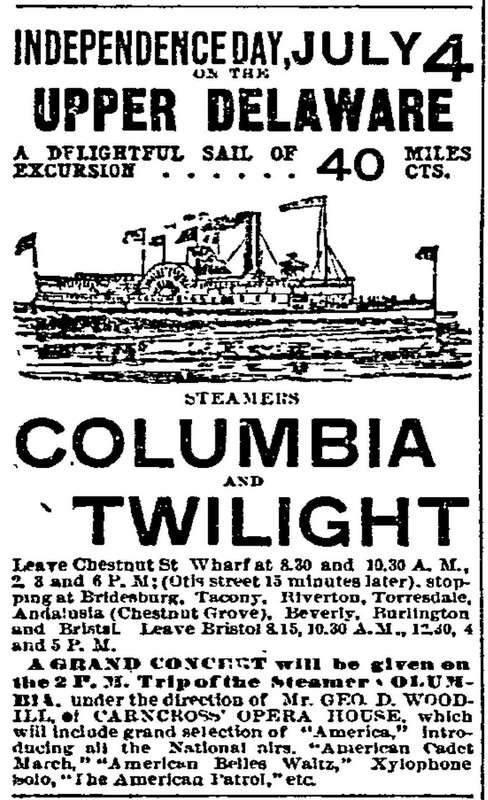 In 1900, the steamer Twilight became icebound near Trenton, and Charles Biddle rescued fifteen ice skaters with his boat when they got caught on a Delaware River ice that was breaking up. In 1903, two young Riverton men saved another skating party from drifting ice, again by boat. The Feb. 8, 1934 New Era, Riverton’s now defunct hometown newspaper, described how Benjamin Lippincott’s mule-drawn wicker sleigh thrilled “the younger generation of Riverton” when it came into town. Dale Baker Fitler was born in Riverton exactly nine months after the famous snow blizzard in March 1888. Drifts reached fifteen to thirty feet high along the riverbank. Now, that blizzard really was historic. The Blizzard of 1888 was of the most famous snowstorms in American history, it hit the eastern United States March 11th and 12th 1888. The Great White Hurricane paralyzed communities from Maine to Chesapeake Bay. Cities became isolated when telephone and telegraph wires snapped, trains stopped, and roads became impassable. The National Weather service estimated that 40 inches of snow-covered New York and New Jersey. Philadelphia claimed high winds blew up to 60 miles an hour, creating snowdrifts 40 to 50 feet high. It’s a good thing we missed out on that kind of historic snowstorm this time.